Chaoran Zheng, Chinese Corner Project Assistant, created a video clip of Seminar on Classroom Management in Chinese Lanugage Classes held in Walsh Library on February 23, 2018. Liuqing Yang, Chinese Corner Project Assistant, created a video clip of Chinese Speech Competition held by Asian Studies Program at Seton Hall University on April 20, 2017. Thirty-eight students took part in the competition from beginner to advanced levels. Every speech had its own characterisitcs. Prof. Jeffrey Rice of Chinese Literature and Civilization and Director of Asian Studies, and Prof. Dongdong Chen, Department Chair of Languages, Literatures and Cultures, gave supportive remarks to the students. Everyone enjoyed the competition. “Chinese Corner: From Library to Classroom” was selected for poster sessions on the 82nd IFLA World Library and Information Congress in Columbus, Ohio during August 15 and 16, 2016. Chinese Corner is a collection of books and videos for learning Chinese language, history and culture. Pictures from the poster of "Chinese Corner: From Library to Classroom" at VALE / NJ ACRL / NJLA CUS 17th Annual Users' Conference, 1/15/ 2016 "Library as Locus: Energizing your Campus Community" Busch Campus Center, Rutgers University, Piscataway, New Jersey. Mid-Autumn Festival Celebration at Walsh Library on October 5, 2017 (by Liuqing Yang, 2017). Walsh Library’s Chinese Corner had its opening ceremony at noon on Thursday, November 20, 2014. Walsh Library has received a donation of 300 books, CDs and DVDS, and funding for management and promotion of the project. The Chinese Corner is funded by China Hanban, a National Office of Teaching Chinese Language, and coordinated by China Educational Publications Import and Export Corporation Ltd (CEPIEC). 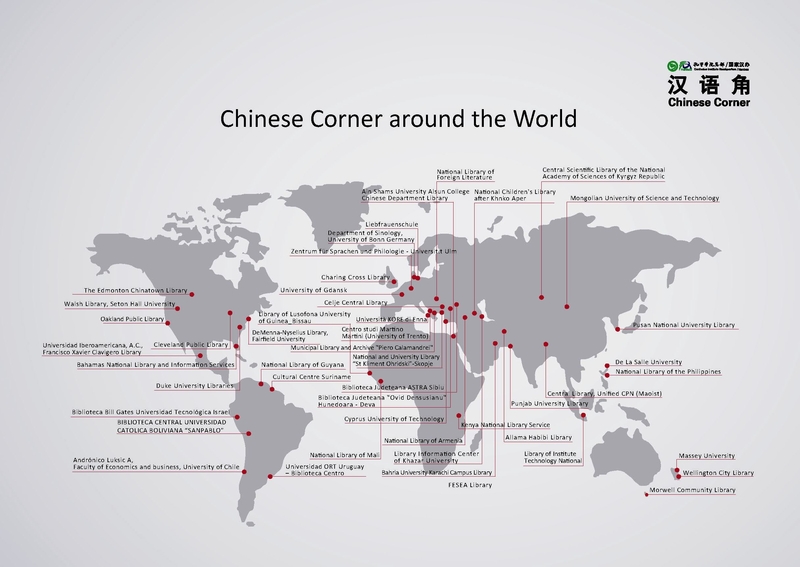 China Hanban has funded 39 libraries in 27 countries as of July 2014. Library Dean, Dr. John Buschman said that the establishment of the Chinese Corner made our library in group with Duke and Cornell Universities. Dr. Xue-Ming Bao, Electronic Resources Librarian and Library Liaison to Asian Studies, applied for the grant, and thanked all his colleagues for their support and help. Professor Dongdong Chen, Director of Chinese Program, and Director of Graduate Program in Asian Studies, informed the audience of the history and prominence of the Chinese Program at Seton Hall University, and appreciated the good support from the Library. Qingqing Lan, a Graduate Assistant, helped with cataloging the books and reached out to the students in the Chinese language classes, She created a video program to promote the Chinese Corner (See the promotional video clips above). The Chinese Corner has expanded our Chinese language collection and increased the visibility of Chinese Program. Hopefully it will attract more students to learn Chinese.